This is the stamp I did at the class last week using Clarity stamps and Pan Pastels. Don't think I'll be buying the pastels although lovely to use can't see me making the most of them and they are expensive. Ooh, that's lovely Cath, I bought 3 but they're not great together and I think I need a class as I don't really know what to do with them. I got half a dozen of the pastels too. Don't like 'em, lol. Only use a blue for my skies and that's about it. Tha's gorgeous, Cath, but I know what you mean about buying stuff that's expensive when you don't know how much you'd use it. 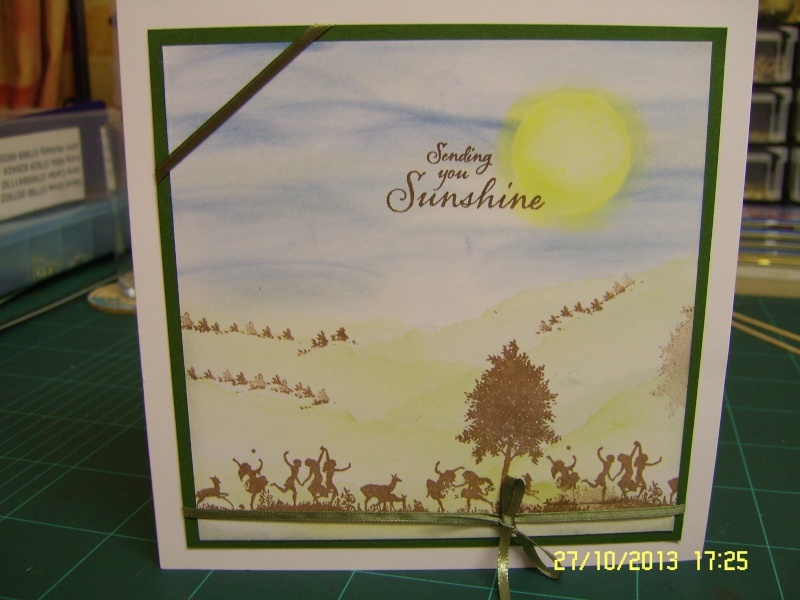 You can get the same effect for the hills with some torn paper, a stamp pad and some cut-and-dry: check out the Create & Craft TV website, as I think you can access the Barbara Gray tutorials from there. Lovely card Cath. I have watched a couple of her tuts on the C&C website. thats so pretty cath love the stamp . its a shame when that happens with things , you see something you like but nt really sure how to /if you would use them enough to warrant the expense .ive got stuff in my room where i though sod the expense and then they sit in drawer for years . Gorgeous, need to see what pan pastels are though. Ah had a look, similar to the chalks we all used but better I am guessing.